The finest aneroid barometer available today for under $700. Proteus is temperature compensated and accurate to within ±0.08 inches of mercury. The dial displays in inches of mercury (27.5"-31.5") and kilopascals (93.2-106.7), and is equipped with a resettable needle pointer used to mark changes in pressure. A cutaway dial window reveals an heirloom-quality French barometer movement. 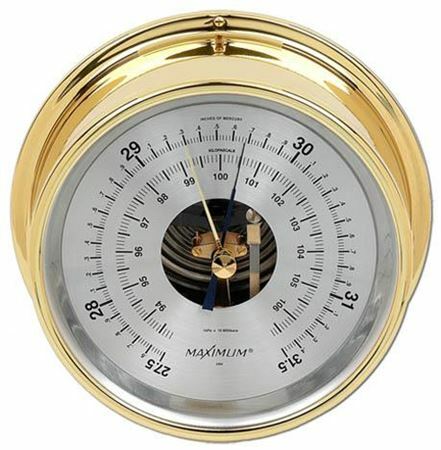 With no external wires or sensors, this is an ideal barometric pressure instrument for mounting on a Mahogany or Oak Mantle Mount or on a Single Instrument Panel, also available in either solid Oak or Mahogany. Please specify altitude if above 2,000’.